Sometimes, you just need the option to sew on the go. For frequent travelers, sewing class attendees, and sewing fanatics, portable sewing machines are simply a must-have product. This thorough guide will tell you exactly what a portable sewing machine is, if you should get one, and provide a list of three of the best portable sewing machines available today. What Is A Portable Sewing Machine? Traditional sewing machines are often weighty appliances that stay put on a table or surface. With these full-size machines, the sewer must come to the machine to work, without much flexibility to sew in other places. Portable sewing machines are different. With smaller, lightweight frames, these machines can be moved from place to place much more conveniently, giving you the power to sew wherever you like. Despite their small size, portable sewing machines often include many of the same features that regular machines do. Some of the best portable machines include multiple stitch or speed options, automatic bobbin and thread winding, and even a free arm to construct clothing more easily. Portable sewing machines typically weigh under 10 pounds, making it possible to carry them along in a suitcase or tote bag. Some options weigh as little as 2 pounds and could easily fit in a purse! Portable sewing machines have several awesome qualities that make them popular among sewers. The main benefits of portable machines are listed below. It may be obvious, but the main benefit of portable sewing machines is the ability to take them anywhere. The option to carry a machine with you on the go will allow you to get more work done. Portable sewing machines cost far less than their full-size competitors. Whereas a full-size machine could cost several hundred dollars, most portable machines are well under $100, with many options being as inexpensive as $20 or $30. Portable machines are smaller, which forces their technology to be more streamlined. This makes the process of learning to use the machine faster and less complicated. 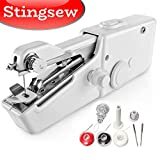 When it comes to repairing a small tear in a piece of clothing or stitching up a children’s craft project, you shouldn’t have to spend extra time setting up a large sewing machine. Portable sewing machines are quick to set up for small projects, saving you time and energy. Portable sewing machines don’t have as many stitches to choose from as full-size machines, often only offering a basic stitch. With their limited size, portable machines aren’t ideal for sewing large, unwieldy items like thick curtains or long dresses. Portable machines are often made out of lightweight materials, like plastic, that aren’t the most durable. This can also mean that a portable machine won’t be powerful enough to handle specialty fabrics. Who Should Get a Portable Sewing Machine? Portable sewing machines are better suited to the needs of certain types of sewers than others. Consider the scenarios listed below to decide if this type of machine is right for you. Since portable sewing machines are an affordable alternative to regular-sized machines, they’re a great option for beginners or people who sew infrequently. If you just need a machine to occasionally perform basic tasks, getting a portable machine is an awesome way to save some money without sacrificing any sewing functionality. Individuals who only ever complete small-scale sewing projects, like minor clothing repairs, may find a portable sewing machine to be a convenient, efficient option. These machines can help you complete small, simple tasks quickly and easily. If you have kids that are dying to learn how to sew, starting them on a portable machine is an excellent idea. These machines are simple to operate and understand so that even kids can start sewing quickly. Plus, with a low price tag, a portable machine is less of a monetary investment than a full-size option, just in case your child changes their mind after a few weeks about wanting to sew. Tired of lugging that full-size sewing machine to your quilting class every week? In that case, a portable sewing machine is for you. Anyone who needs to be able to sew in more than one location will benefit from this type of machine. We’ve taken the work out of shopping for a portable sewing machine for you with these 3 products. These portable machines are affordable, highly rated, and great for all types of sewers. 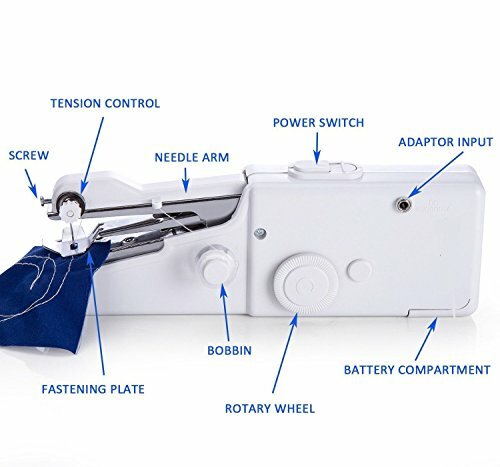 This cordless mini sewing machine from Stingsew takes portable to a whole new level. It’s battery operated so that you don’t even need to find an outlet to get sewing. It’s perfect for crafting, repairing clothing, and other simple, quick sewing projects. This mini sewing machine can handle just about any material, from silk to wool to denim. Weighing around 10 ounces, this machine can fit just about anywhere; you can easily carry it around with you in your bag. It’s incredibly simple to use, with an easily locatable tension control, bobbin, and power switch. The Sewsting portable machine only performs a basic chain stitch, making the types of projects you can complete limited. The 4 AA batteries required to operate this machine aren’t included. The setup of this machine is different from a traditional sewing machine and may take time to get accustomed to. 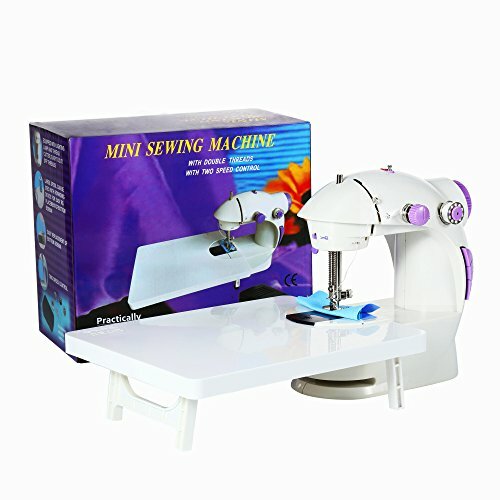 The Varmax 201 Mini Sewing Machine is a portable machine that can accommodate large projects thanks to the included extension table; it can also be operated by switch or with the included foot pedal. With two-speed control, a thread cutter, and lighting lamp, this machine packs several great features into a miniature frame. This machine weighs a mere 3 pounds and is battery powered for complete portability. The included extension table easily attaches to the machine and is ideal for sewing shirtsleeves, pant legs, and other large projects. Operating this machine is simple enough for first-time sewers or children, and it comes with a helpful manual. This machine from Varmax only includes one stitch type and size, which limits project possibilities. Elastic knitted fabrics and thick cloth can’t be sewn on this machine. 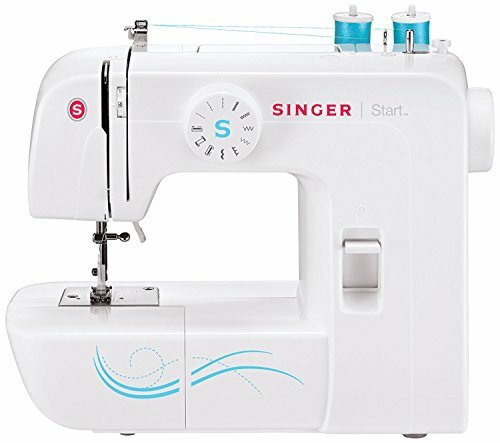 The Singer Start 1204 Sewing Machine is user-friendly for beginners and includes a selection of fantastic features to take your projects to the next level. This machine comes with 6 built-in stitches that each have a pre-set width and length for ultimate ease of use. It weighs just 7 pounds and costs approximately $70, which is an outstanding price for this high-quality product. A 4-step buttonhole is included with this machine’s 6 built-in stitches, which is an excellent feature for garment construction. This machine comes with 3 sewing feet: an all-purpose foot, a zipper foot, and a buttonhole foot. This allows you to complete many of the same projects as you would with a regular machine. Advanced features including a free arm, automatic bobbin winding system, adjustable tension, built-in reverse, and extra-high presser foot lifter are all included. Although this machine is designed for beginners, the foot pedal may be difficult to operate for those who are new to sewing. This machine doesn’t include needle position adjustment, which is a feature more advanced sewers may require for their projects. A large portion of this machine is constructed from plastic, making it less durable than many traditional machines. Portable sewing machines are fantastic options for anyone who moves a lot or likes to sew on the go. There are a lot of different factors to account for when selecting your portable sewing machine and hopefully this guide answered all of your questions. If you have more questions or need help finding a portable sewing machine just leave a comment below and I'll help you find the perfect sewing machine for your situation! portable sewing machine are really good for those who have to do some work in the outside and sometimes in the room on the bed. But these machines can not do some heavy job for users. why the foot paddle is difficult to use? Welcome to The Fallen Hem! My name is Nora and I LOVE sewing! I started this stie to share my experience with sewing and help people find sewing patterns and projects. © 2018 TheFallenHem.com | TheFallenHem.com is a participant in the Amazon Services LLC Associates Program, an affiliate advertising program designed to provide a means for sites to earn advertising fees by advertising and linking to amazon.com. Content on this site may contain affiliate links. These links take you to third-party sites, such as Amazon.com.